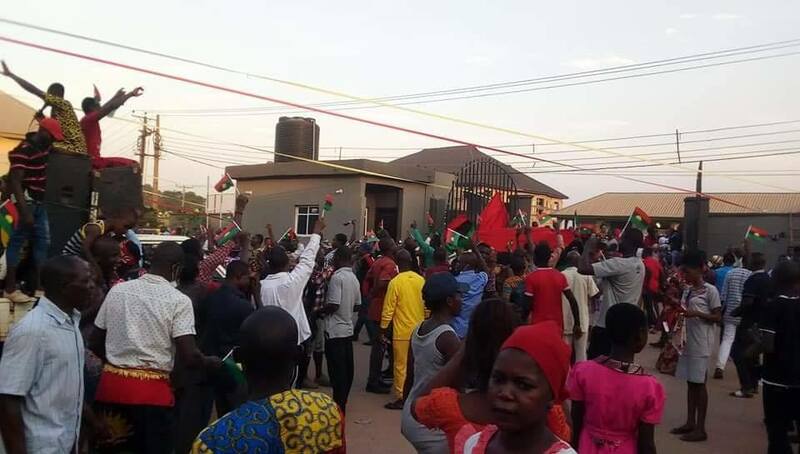 ONITSHA– Members of the Indigenous People of Biafra, IPOB, in Onitsha/Nkwelle-Ezunaka, Anambra state last Sunday, November 25,2018 joined the Catholic Church community in the area in the procession and celebration of Christ The King/Corpus Christi. The procession was carried out along Nsugbe College Road and Onitsha-Otuocha expressway both in 3-3 area. The benediction took place at St. Theresa's Catholic Church, Mba Farm. Seizing the opportunity as a means for evangelism, the youths numbering up to 200, stormed the church in droves with flags singing, dancing and praying to God in the blessed Eucharist to come to the aid of Biafrans. The celebration was marked with lots of surprises from IPOB family in the area. They provided sachet water to congregants participating in the procession. Biafran flags were shared to even non-family members. IPOB family members also came with their own live band (sound system of worship) and the elated crowd who gathered by the band was far larger than any other band in the event. Everyone wants to identify with IPOB. They all felt at home dancing and praising God in the blessed sacrament while flying the Biafra flag. Some IPOB youths also joined the church security outfits – Men of Order, Boy Scout, and Church Wardens – to maintain peace and orderly atmosphere during the period. Drivers, passengers and passers-by were happy seeing IPOB youths actively participating in the event as many of them parked and joined in the celebration. A teacher from Bethroot Model School 3-3 who also participated in the procession was overwhelmed with the generosity of IPOB family members in providing everyone with cold water to quench their thirst while procession was going on under the scorching heat of the sun. The most remarkable part of the event took place at the climax of the benediction when the priest was raising the body of Christ in the Monstrance, Biafra flags were flying and saluting God in the Eucharist, others with big flags were kneeling on the altar rail, praying for the restoration of Biafra. 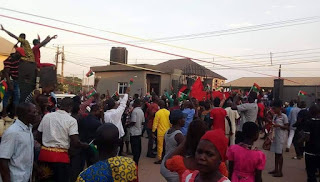 Others were heard extolling the quality of organization, peace, and order maintained by IPOB family members on the course of the procession and benediction. They saw firsthand how gracious IPOB members can be while preparing for the coming of God's kingdom on earth. At the end of it all, there was no report of any breach of law and order recorded on the course of the Christ the King/Corpus Christi procession and benediction which IPOB family members were recognizably part of. Recently, it can be recalled the actions taken by Biafrans against campaigning for Nigeria elections at a Catholic Church in Aba. In turn, the parish priest of Christ the King Cathedral Catholic Church, Aba, released a press statement against IPOB, accusing her members of invading and disorganizing church programs. We can all agree that many Biafrans in the struggle are Christians worshipping in different denominations according to their faith and choice. And they cannot stand it when those who are meant to protect their interests are part and parcel of their problems. They cannot stand it when the pulpit is now politicized against the wishes of Biafrans. And that is the injustice they stood against in Christ the King Cathedral Catholic Church. Biafrans are Godly people. We are the embodiment of Chukwu Okike Abhiama-God on earth. We extol the sanctity of the fear of God and respect for human dignity, freedom of worship and expression. That is why there is nowhere in history Biafrans engaged in war of conquest or forced people to accept their culture, identity or religion. Rather they welcome other people's culture, worship, and identity even to their own detriment. The Christ the King/Corpus Christi procession and benediction actively participated by IPOB family members in 3-3 Area Onitsha/Nkwelle-Ezunaka is yet another evidence that we are the most peaceful freedom fighting outfit in the whole world. We are all united as Biafrans irrespective of your colour, religion, and beliefs. We are Biafrans. All Biafrans are asking for is our God-given Freedom, to leave free in our fathers land Biafra.